RC HOBBY BATTERIES & more! and newer SPEkTRUM DX6, DX7 (check your transmitter for compatability). white balance charging plug, and red JST charging/power plug. PRE-CHARGED & READY TO USE ! STAYS CHARGED IN STORAGE ! Retains up to 80% of its charge after 1 year ! - Retains up to 80% of its charge after 1 year ! Superlattice Alloy NiMH battery cells. Plugs right into your transmitter. RECEIVER & TRANSMITER BATTERY PACKS made with eneloop cells. MEMORY-FREE; HIGH CAPACITY; they arrive to you PRE-CHARGED and READY TO USE ! your requirements. eneloop cells can be re-charged with most Ni-MH smart-chargers. charging range for the AAA-size is 80mA/hour (slow) to around 400mA/hour (fast). The recommended charging range for AA_size is 200mA/hour (slow) to 1000mA/hour or 1A/hr (fast). RECEIVER battery Packs are spot-welded, with protective insulation added where needed. High-strand count copper-strand wire is used. Connectors installed for $3 extra. Choose shape (Flat, Square, or Offset style). 1.7" tall, 1.7" across, 0.42" thick. 2.0" tall, 2.3" across, 0.6" thick. 2.0" tall, 2.85" across, 0.6" thick. & eneloop pro 950mAh AAA battery packs. Extra Long Life ; These arrive to you PRE-CHARGED & READY TO USE. Best of all, they RETAIN THEIR CHARGE WHEN NOT IN USE !! These battery packs are MADE IN USA by BATTERIES AMERICA ! 4.8v Flat pack dimensions approx. 6v offset shape available also. 6.0v Flat pack dimensions approx. 9.6 volt; Spot-weld assembly, highest-quality manufacturing. Tip Clip (9v snap-connector style) starts at $7.00 extra. List price for basic pack (no connector) is $49.00 ea. (Choose Shape/Connectors/Quantity AFTER you click the BUY button. These fit neatly inside the Futaba 9Z battery housing. for + and - wire connecting. PRE-CHARGED and READY TO USE. NEW - Battery packs for HiTEC AURORA 9 transmitter. Includes connector. 2000mAh eneloop Pre-Charged model shown. Also available as 2500mAh or 2700mAh. The Eneloop 2000mAh model RETAINS ITS CHARGE up to a year when not in use. The 2500mAh & 2700mAh models are long-life NiMH cells. NEW - Battery packs for AIRTRONICS SD-10G transmitter. Includes connector. 2000mAh eneloop model shown. 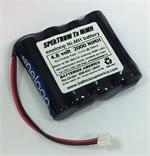 Also available as 2500mAh eneloop, 2500mAh NiMH or 2700mAh NiMH. We manufacture these battery packs with premium-grade rechargeable cells. See our Ads in Model Aviation and Model Airplane News ! protective insulation where needed, copper-strand wires (Connectors installed for just $3 extra), & Shrink wrap. Pack shape can be chosen as Flat, Square, or Offset style. Ni-Cd Receiver Packs with Connector. Choose Flat or Square shape when ordering. or (3) AIRTRONICS older style. Remember, Airtronics "Z" is NOT the traditional AIRTRONICS connector. The Airtronics "Z" is the same as JR-HITEC. 4.8 volt receiver packs. Made with 4 cells (each cell is 1.2 volts). make sure you have a charger that is strong enough to effectively re-charge them. charger system for $ 34.95 BUY (scroll up about 5 inches for picture & description). same physical size as common RC pack; LONG LIFE. IMPORTANT NOTE: Most stock chargers cannot charge 6 volt battery packs. the IC-14V for $ 34.95 BUY (scroll up a little for picture & description). 6.0 volt 1650 mAh (AA size "HR-AAU") $ 23.95 ea. BUY Ni-MH (NICKEL METAL HYDRIDE). higher-capacity battery pack, made with 5 x AA-size cells. EXTRA HIGH CAPACITY BATTERY PACK, made with 5 x AA-size cells. A good, advanced charger (like the IC-14V) is needed to re-charge these battery packs. HIGHEST-CAPACITY / ULTRA LONG LIFE battery pack, made with 5 x AA-size cells. just snip the "looped" jumper wire shown in picture). Maximum current output = 5 Amps continuous, with 10 Amp peak. Regulator is bypassed when RX battery voltage is less than 5.4v. The ACC134N ensures optimum Servo performance. Male & Female plugs to fit Futaba, JR, HITEC, and AIRTRONICS Z equipment. (B) utilize an adapter between the 2-Pin Red JST BEC connector and your particular receiver connections. TRANSMITTER BATTERY PACKS FOR YOUR GROUND-BASED CONTROLLERS. These battery packs are manufactured by US, right here in the USA. Even though the capacities are different, the packs are all the same size. an advanced charger system (like the IC-14V) to re-charge them. 9.6 volt 700mAh Ni-Cd - $ 22.95 ea.BUY with wire leads. Connector $3 extra. 9.6 volt 1100mAh Ni-Cd - $ 27.95 ea.BUY with wire leads. Connector $3 extra. 9.6 volt 1650mAh Ni-MH - $ 32.95 ea. BUY with wire leads. Connector $3 extra. 9.6 volt 2500mAh Ni-MH - $ 39.95 ea. BUY with wire leads. Connector $3 extra. 9.6 volt 2700mAh Ni-MH - $ 42.95 ea. BUY with wire leads. Connector $3 extra. 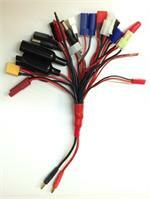 ends separately ($2.00 each), or you can order packs with connectors installed - add $3.00 to prices listed above. NOTE: Many Futaba, JR, HITEC, and AIRTRONICS transmitters use the same connectors as the receiver packs. We've got them !! connectors (NT-8JY) or the HiTEC 2-Pin square white connector (flash, focus, prism, lynx series). is also available; for this connector, add $3.00 to the price of the square pack. on a Square pack. We have these as well !! PLEASE CHECK & CONFIRM YOUR CONNECTOR TYPE BEFORE ORDERING ! Connectors for Receivers, extensions, switches, etc. (plugs into battery or switch harness); charges 9.6v packs @ 70mA (plugs into Radio Transmitter). (plugs into battery or switch harness); charges 9.6v packs @ 55mA (plugs into back of Radio Transmitter). Note: Typically, the "male" connector ends are on receiver battery packs. Note: some Futaba catalogs shows a 9.6 volt flat pack with this connector on their 9C transmitter page. Futaba J flat connector (see further below). 8103 transmitters have the 2-pin black connector. Newer XP8103A have the white connector shown below! JR PROPO Mating charge connector for JR 2-pin Black connector above. Has 8" wire leads for easy hookup to your charger. Prt # ChgJRT. 2-pin Flat White TX connector. For SQUARE packs. This connector is on the "JR-2" battery pack. X-378 HELI version, SPEKTRUM DX6, SPEKTRUM series. OEM battery pack model # JR-2. NOW IN STOCK ! JR PROPO, SPEkTRUM CHARGING connector for 2-pin Flat White TX connector. Part # JRWhtChg. Includes 6" wire leads. Plugs into your JR Transmitter battery; can be attached to stand-alone chargers. Ideal component for charging the high-capacity Transmitter packs without tying up your transmitter. Challenger, OPTIC 6, OPTIC series. It is ALSO found on battery packs that fit the AGRESSOR CRX, CHALLENGER, and 720. ALSO AVAILABLE: HiTEC Charging end (not pictured; has wire leads). Fits onto HiTEC TX connector just above. 8UHP, Super 8, 9VAP, 9ZAP; 9CAP, 9CAF, 9CHP, 9CHF . For FLAT (side-by-side) packs: 3-PJS. JR PROPO - HiTEC - AIRTRONICS "Z" (male). For SQUARE packs: JR PCM-9, PCM-10, 10S, 10X. For 3x2 packs (3 sticks of 2) : for AIRTRONICS SD-10G battery. JR PROPO (Female). Charging end. You plug your battery packs INTO this connector. For SQUARE packs. AIRTRONICS (male). For SQUARE packs (VANGUARD, QUASAR, CHAMPIONSHIP, VGR4, RD-6000 / 8000, Z-series. REMEMBER: The LOWER the Gauge number, the THICKER the wire. 4.0mm - pkg of 1 male & 1 female gold-plated. $ 3.95 / set BUY . $ 3.75 for mating SET of 2 housings & 4 Gold-plated pins BUY . $ 1.95 for Battery Connector (1 housing) & 2 Gold-plated pins BUY . $ 1.95 for Motor / Charging Connector (1 housing) & 2 Gold-plated pins BUY. SHRINK WRAP SPECIAL: (All 3 sizes are measured top-to-bottom flattened. (1) 45mm size (1 3/4 ") 10 feet for $7.50 BUY LIMITED QTY ON THIS SIZE. Fits 2/3AA side-by-side packs, 2/3 AE side-by-side packs, single "C" cells, 1/3 AA Square packs or style C.
AAA packs-style E, Sub-C side-by-side packs, Square TX packs, and 2/3 AA square or style C packs, etc. Fits "C" size side-by-side packs, 4.8v AA square packs, 4/5A packs-style E, etc. Voltage, & Capacities! Packs come with heat shrink & wire leads. R/C PACKS w/ SANYO "CADNICA" Standard Charge Battery Cells: (flat, square, or offset packs). If you want to order battery packs with a connector, choose the connector type after you click BUY . Choose from (1) Futaba J, (2) JR-SPEKTRUM-HITEC-Airtron. Z, or (3) AIRTRONICS traditional. Handy hint: A Futaba " NR-4M " battery pack is a AA flat pack (style A) with a Futaba J connector. Our standard-capacity for this type is 700mAh, which is an upgrade from the original battery. (These are AP-brand cells. Cell is about 1" tall & 7/8" diameter. KRAFT 5C Transmitter = Two 4.8v SQUARE packs. KRAFT 7C Transmitter = Two 4.8v "B" packs. KRAFT Receiver = One 4.8v "B" pack (two sticks of 2). Note: the older Kraft transmitter packs consist of two 2/3 Sub-C square packs w/ leads. (plugs into battery or switch harness); charges 9.6v packs @ 70mA (plugs into Transmitter). (Futaba J, JR-SPEKTRUM-HITEC-Airt. Z, or AIRTRONICS, and Voltage (Confirm 4-cell 4.8v or 5-cell 6.0v). (Futaba J, JR-SPEKTRUM-HITEC-Airt. Z, or AIRTRONICS traditional, and Voltage (Confirm 4-cell 4.8v or 5-cell 6.0v). Standard size Rx pack, with LONG LIFE ! PACKS w/ NiCd FAST CHARGE CELLS: (Prices are for flat, square, or offset). Packs can be ordered WITH choice of connector for $ 3.00 extra per pack. IMPORTANT: after you click BUY , you can still "design" your pack online! Choose shape, connector (Futaba J, JR-HITEC-Airt. Z, or AIRTRONICS traditional, and Voltage. CONFIRM 4-cell 4.8-volt OR 5-cell 6.0-volt). Can be fast-charged or Slow-charged. your requirements, and we will provide a price quote. 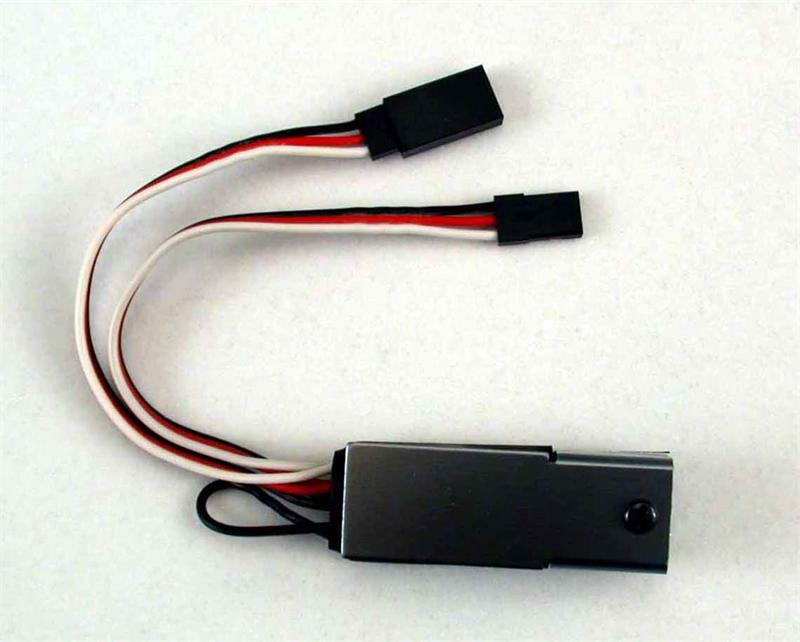 Extra-high capacity receiver packs for your R/C models. Choose from 4.8 volt or 6.0 volt versions. Different shapes can be chosen. can be installed for $3.00 additional per pack. (Futaba J, JR-HITEC-Airt. Z, or AIRTRONICS traditional, and Voltage (CONFIRM 4-cell 4.8-volt OR 5-cell 6.0-volt). can be chosen as Flat, Square, or Offset style. high capacity & high quality in AAA size. Standard-dimension Rx pack; long life; high quality. Retains up to 80% of charge for 1 year ! Standard-size Rx pack; longest life; highest quality. Made with EP1600A 2/3A cells. 4.8 volt versions are available as flat or square. 4.8 volt nose cone pack (3up, 1 down) is extra 20%. 6.0 volt versions are offered in flat or offset shapes at posted prices. 6.0 volt "2x2x1" style ("house" profile) can be ordered for 20% extra cost. If you require a custom shape, please call us 1-800-308-4805 for a quote. 1600mAh, made w/ 2/3A-size Ni-MH cells. Each cell is 1.1" tall, 0.67" dia. Flat pack is approx 2.75" across. Available as 7.2v, 8.4v, 9.6v, 10.8v, or 12.0v packs. Connectors installed for additional $$. Available shapes shown below: Side-by-side; Twin-Stick; Two Rows; Four sticks; Offset. depending on the connector. See below for connector assortment, or call us to confirm type. (Pricing includes wire leads; Connectors are Extra $$). CRAZY MAX, HUMMINGBIRD, and any other model that can accommodate AAA-size cells. YOU choose the pack shape; WE make it for you ! Available as 7.2v, 8.4v, 9.6v. 10.8v, or 12.0 v packs. Prices exclude connectors. Available shapes for listed pricing: (A) Side X side; (B) Twin-stick; (C) Two Rows; (D) Four Sticks; (E) Offset. More Ni-Cd battery packs w/ SANYO & SAFT brand cells listed below. Add red BEC/JST/GWS conn. for $3.00 extra. Add TAMIYA conn. for $3.00 extra. Cell model #s in RED are SANYO FAST-CHARGE series Nickel Cadmium batteries. & other sport models. Includes TAMIYA connector. Rechargeable Battery Pack. List $ 36.00 ea. you create your pack from the drop-down menus. Select "B" as the pack style (Twin Stick). Select "TAMIYA" as the connector. This adds only $1.00 to the posted prices. Other connectors - are available for additional $. These Battery Packs are MADE TO ORDER. R/C motor packs (fits many different TYCO toys & other brands as well). Size: 4" tall x 2.5" across x 0.65" thick. Choose battery pack(s) here. Choose package (Battery & charger) further down. SPEED CHARGER: Plugs into 110-120VAC outlet. Other end plugs directly into 9.6v pack. charges 1100mAh pack in 4 hours; charges 1650mAh pack in 6 hours. This charger must be disconnected / unplugged at the end of the charge cycle! $ 12.95 ea. Futaba-JR-SPEkTRUM-HiTEC-Airtronics Z, Post & Nut, bare wires). Plugs into the YT-0006S, OMNI-PULSE, and many other chargers. Made with high-quality insulated wire. List $ 22.00. 4mm bullet red, Kyosho (mini Tamiya), PowerPole, . Plugs into the YT-0006S, OMNI-PULSE, and many other chargers. Made with high-quality insulated wire. List $ 65.00. The connector that goes on a battery pack is the one that has only 2 metal prongs. The charger / motor connector has 4 metal prongs. The connector that goes on a battery pack is the one that has only 3 metal prongs. The charger / motor connector has 6 metal prongs. EC3 Connectors (BLUE) $ 3.95 for mating SET of 2 housings & 4 Gold-plated pins BUY . AstroFlight ZERO LOSS Connector Set - mating SET of 2 housings & 4 pins $ 18.95 / set BUY . $9.95 for 1 housing & 2 pins BUY. The Kyosho "Battery" end is the opposite, visually, of Tamiya. It is also slightly smaller. The male connector (goes on battery) housing measures 7/8" long x 3/8" across. The female connector housing measures 1" long by 13/32" across. Power connectors (red, 2-pin, with leads). For small scale electric R/C applications. 22 Gauge wire. Typical 5 Amp maximum load. Wattage "Black Wing" connector. Official part designation # SMP-02V-BC. Has banana plugs at one end, and assorted connectors (for motors, RX, TX, etc) & bare wires at other end. you fit it over wire, move it into place, and then apply heat to it. It shrinks down tight, while also gaining in thickness. It provides insulation for exposed metal. It is also used for stress relief for wire. Shrink tubing typically can reduce down to as much as half its original diameter. Available at $ .50 per foot. You can add quantities after you click BUY. Shrink Wrap - this product goes over your battery Packs. and protects the exposed metal surfaces of battery cells & strapping. Up to 3": $1.00 / foot. Over 3": $1.50 / foot. SHRINK WRAP SPECIALS: (All 3 sizes listed below can reduce down to less than half their original size. have excellent electrical conductivity, and are easy to solder onto, using electrical solder and a 40W+ Soldering Iron. Use these as a connecting "bridge" from one battery to the next. a good hot soldering iron (around 100W), some good flux, a well-scuffed battery surface, and good fast technique. Note: if your particular need is not listed in this catalog, please call us for availability & pricing! Mail, phone, FAX, & E-mail orders welcome. MC / VISA / DISC / AMEX welcome. Due to market forces, prices are subject to change without notice.